The Second Newbury campaign began with the total defeat of a Parliamentary army under Essex at Lostwithiel. The King served up with a golden opportunity, blew it. Taking his time, the initiative was lost. Moving to relieve the siege of Donnington Castle just north of Newbury, the King did nothing hurriedly. 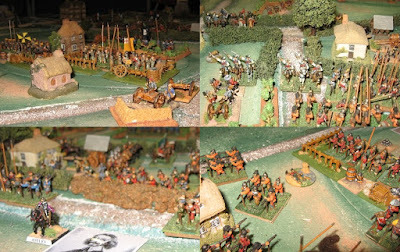 While the King tarried, three armies, Waller's, Essex's and Manchester's came together. This gave the Parliamentary armies a huge advantage in strength. The Rebels had serious problems, though. Waller's army was reduced to a shadow of it's former self. Manchester was at odds with Cromwell, feeling that Cromwell had grabbed all the glory for Marston Moor, to his detriment. Essex had lost his nerve and the confidence of the army. Essex was ill and the command of the combined army went to Sir William Waller. In a tense council of war the night before the battle, Waller's bold double envelopment plan was agreed to. The plan called for Manchester to attack in coordination with Waller's attack from the opposite direction, the signal being a cannon shot. The signal idea seems a bit flawed as it presumed the Royalists would not fire a cannon. He [the King] chased Waller out of Andover on 18 October , but the Roundhead escaped to join Manchester at Basingstoke. Charles had hoped to relieve the Royal garrison of Basing House, but on 21 October Essex joined Manchester in the vicinity, making relief impossible without fighting a major action. On 22 October Charles marched towards Newbury, already the site of one battle. The Committee of Both Kingdoms had appointed no overall commander, which in effect gave Manchester the command as Essex was ill.
At Newbury the King's army was well deployed, resting upon three strongpoints, Shaw House, Donnington Castle (held by the Royalists for over a year) and Speen village. The King commanded in person, with old Lord Forth (now Brentford) his deputy, Hopton in command of the artillery, Goring the horse and Astley the foot of the Oxford army; Prince Maurice was also present with part of his western army. Despite the advantage of numbers (perhaps around 17,000 to Charles' 10,000), the Parliamentary commanders decided not to risk a frontal assault on the Royal position, but embarked upon an enterprising but dangerous manoeuvre: the army was to divide, Waller to perform a circuitous march at night to attack the King from the rear, whilst Manchester would storm the Shaw House area of the Royal line. It was a plan fraught with danger, for if Waller's force were discovered the King could have overwhelmed Manchester before having to face Waller. Nevertheless, Waller set off on the evening of 26 October, swung past the Royal left and, though seen by Royalist scouts, some ineptitude allowed him to pass without impediment; nor was the King's army warned of the danger to the rear. 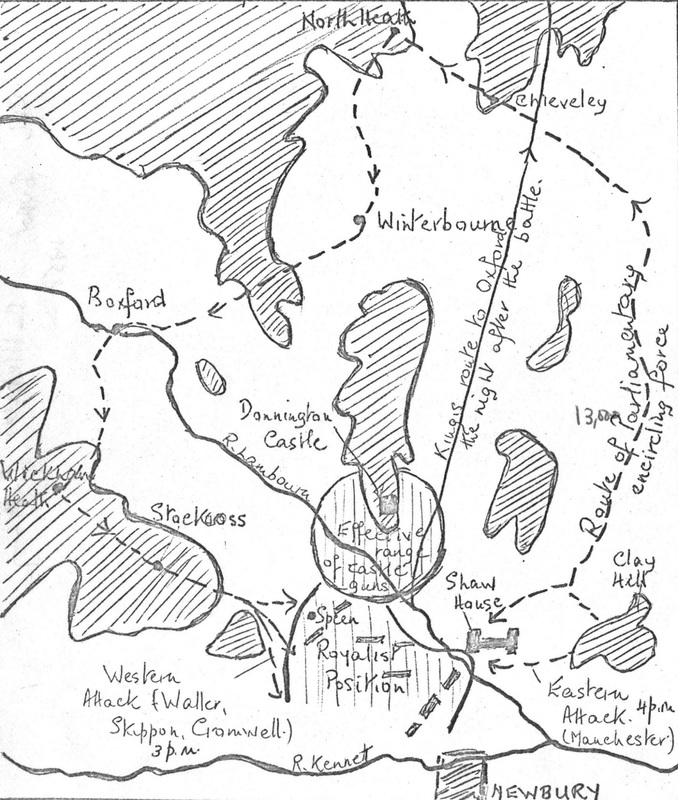 At about 3 p. m. Waller's attack fell on Speen village, taking Maurice's troops completely by surprise; aided by the guns of Donnington Castle they put up a good defense until finally ejected. Maurice's horse was scattered, but Goring's horse repelled first Waller's right-wing horse (under Balfour) and, as it came up, his left (under Cromwell). Manchester, whose troops had been engaged in desultory fighting before Shaw House since daybreak, was apparently unable to recognize the noise of Waller's attack for what it was, and delayed his own assault until about 4 p. m., when it ran out of steam before Shaw House could be stormed. By nightfall the fighting subsided, both sides thinking themselves beaten. 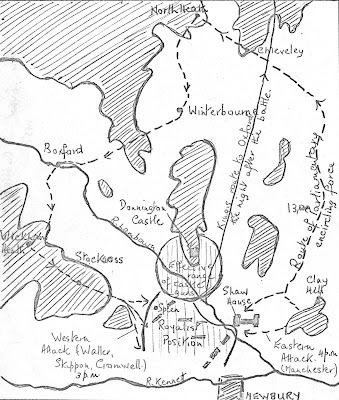 As a Parliamentary attack the fol- lowing day might have been successful, the King retired during the night, going to Bath to inform Rupert of the situation, leaving Maurice and Astley to extricate the army. The Roundheads were not even able to occupy Donnington Castle, much less prevent the retreat of the Royalists to Oxford. Combined with the disaster at Lostwithiel, this battle proved that Parliament needed a totally reorganized army and, perhaps, more determined leaders.